Orkney, in particular, the West Mainland, has large and clean lochs, filled with Brown Trout. The Orkney Trout Fishing Association keeps the lochs stocked and organises competitions. Joining them for a small fee will grant you access to a loch-side store where you can keep your things whilst out fishing. 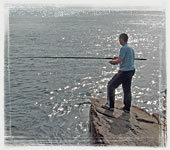 Other than that, fishing in Orkney is completely free. The only thing you will spend is quality time, breathing fresh air and enjoying the peace of birds on the wind, dreaming of catching a record-breaking trout! Sea angling is also worth a try. Boats can be chartered to take you to the best spots. There are also local fishing tackle shops, where good advice comes free of charge! Shore fishing photo © Leonard Bain. All text © Magnus Dixon.